Due to the increased demand for even lower noise figures, AmpliTech introduces its line of cryogenic amplifiers. These amplifiers are designed to operate at extremely low temperatures (to 16K or -273C). The lower temperature operation further decreases the already low noise figures that AmpliTech provides. Indeed, noise figures as low as 0.07 dB are possible at L band frequencies. Efficiency is key for cryogenic amplifiers so AmpliTech offers very low DC power options (as low as +3 VDC), very low current consumption and a very lightweight, compact housing. These amplifiers are very useful for applications that require the absolute minimum amounts of noise injection – such as medical applications, RF imaging, research & development, space communications, accelerators, radiometry and telephony. These amplifiers have been tested, operated and approved by the National Institute of Standards and Technology. Cooling systems are also available for all AmpliTech cryogenic amplifiers. 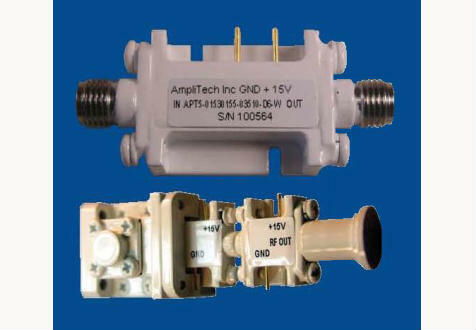 Those amplifiers can be supplied with waveguide or SMA connector interfaces.